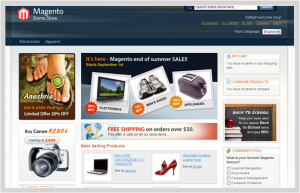 Magento is a very powerful and fast growing ecommerce script, created by Varien. It is an open-source platform using Zend PHP and MySQL databases. Magento offers great flexibility through its modular architecture, is completely scalable and has a wide range of control options that its users appreciate. Analytics and Reporting – the script is integrated with Google Analytics and offers many different reports. Product Browsing – multiple images for products, options for extensive reviews, wishlists and much more. Catalog Browsing – easy navigation, advanced product filtering system, product comparison. Catalog Management – inventory management, batch import and export of products, different tax rates per location, additional product attributes. Customer Accounts – order status and history, e-mail and RSS feeds for products in the wishlist, newsletter subscription, default billing and shipping address. Customer Service – enhanced features for customers’ accounts, Contact Us form, comprehensive order tracking and history, customizable order e-mails. Order Management – create orders through admin area, create multiple invoices shipments and credit memos, call center order creation option. Payment – different payment methods: credit cards, PayPal, Authorize.net, Google Checkout, checks, money orders, support of external payment modules like Cybersource, ePay, eWAY and many more. Shipping – shipping to multiple addresses, flat rating shipping, supports UPS, UPS XML (account rates), FedEx (account rates), USPS and DHL. Checkout – one page checkout, SSL support, checkout without having an account. Search Engine Optimization – 100% Search Engine Friendly, Google SiteMap support. International Support – multiple languages and currencies, list of allowed countries for registration, purchasing and shipping, localization. Marketing Promotions and Tools – coupons, discounts and different promotion options. Site Management – control of multiple web sites, multiple languages, tax rate with support for US and International markets, customizable outlook through templates.